On our visits to other cities, we’re always scouting out places we haven’t been to yet, but have heard great things about. In Louisville, that spot was the Old Louisville Brewery (@oldloubrew). Located in a once vacant neighborhood grocery store, this brewery opened in 2016 under the watchful eye of brothers Ken and Wade Mattingly. Ken had been homebrewing for more than 20 years when his younger brother, Wade, built the small brewery so they could see where their talents would take them. We’re grateful that they did, because the result is a really cool brewery serving really good beer. It’s not just about the drinks. The Old Louisville Brewery has a lively atmosphere with a great neighborhood vibe. Think old school board games, trivia and movie nights, and so much more. While they don’t offer a food menu, they do have free, serve-yourself popcorn and chips and pretzels for sale. They also regularly partner with local food trucks, so check their social accounts before you visit to see who might be there on the same night you are. Just another extension of the previous two perks - the outdoor seating is a real bonus in the warmer, more seasonable months. It’s really comfortable and inviting. More of a backyard with tables and chairs rather than an elaborate outdoor dining experience, but that’s part of the reason why we love it so much. What’s the other part? The walk-up window where you can order your next drink without having to venture inside. All in all, 10-out-of-10. Definitely saved the best for the last. While the atmosphere is a big one for us, the beer is the main reason to visit the Old Louisville Brewery. Let’s just say Ken has put his two decades of homebrewing to good use. The beers on tap rotate pretty regularly, so there’s always something new to try. We sipped on Wade’s Rye IPA and the Old Louisville Kentucky Common (highly recommend both), but rumor has it, the PB&J Ale - made with real peanut butter - is a crowd pleaser. We’ve got it on our shortlist for our next visit. 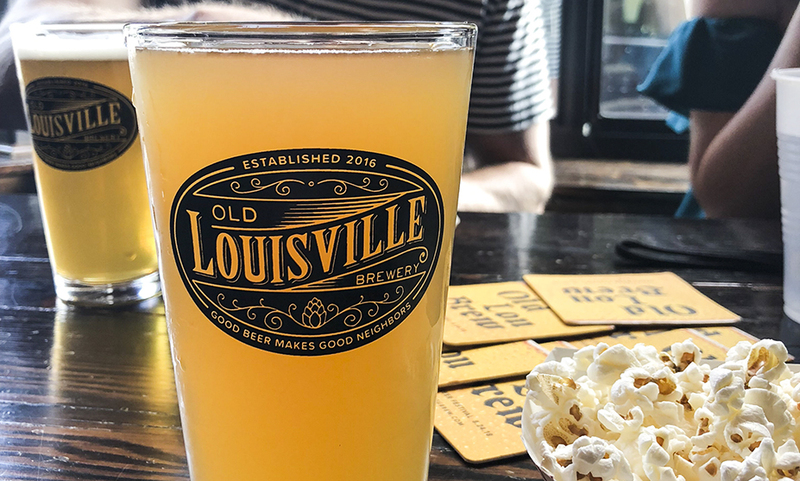 Have you been to the Old Louisville Brewery, yet? If so, what did you like? What should we try next? Share your feedback with us on Instagram or Facebook, @lifestylecommunities, and tag @oldloubrew.